Daily Mirror - Five Reasons Why Microsoft Office 365 Rocks! Office 365 is an all included, communicative and collaborative, subscription based online productivity suite from Microsoft. It brings together various productivity tools ranging from web apps, to email to communication tools. Here are the Five best reasons why it is the ideal solution for any business in Sri Lanka to move to Office 365. It is possible that many businesses unknowingly run non-genuine Office software, putting the entire business at risk. It is estimated that 72% of cyber attacks occur at organizations with less than 100 employees. Such organizations spend 45 days on average to resolve a cyber attack. Don’t let your organization become one of them. Microsoft Office 365 can protect your business from any such attacks. Office 365 applications are accessed through 128-bit SSL/TSL encryption so that if a transmission is intercepted by someone without authorization, they won't be able to read it. Antivirus signatures are kept up to date, and security measures are applied in accordance with international standards. Microsoft monitors the systems continuously for suspicious activity and has a robust incident response protocol in place. Microsoft also does regular security audits. In other words, Office 365 applications offer best-in-class always up-to-date protection. Using untrusted software can bring various risks to your business, such as lack of security, lack of updates or support, and uncertain nature of performance. But still many businesses have been using untrusted software thinking it is cheaper than buying the original software. It is finally time to change that perception. 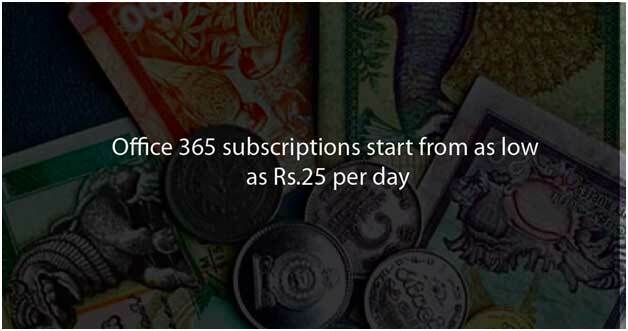 Do you know that Microsoft Office 365 subscriptions start from as low as Rs.25 per day? That is the price of a tea you serve to your office staff every day. The question is, would you risk your business to save the price of a cup of tea? Another most commonly mentioned area of concern regarding cloud services is reliability. Downtime means lost worker productivity and ultimately costs companies money. 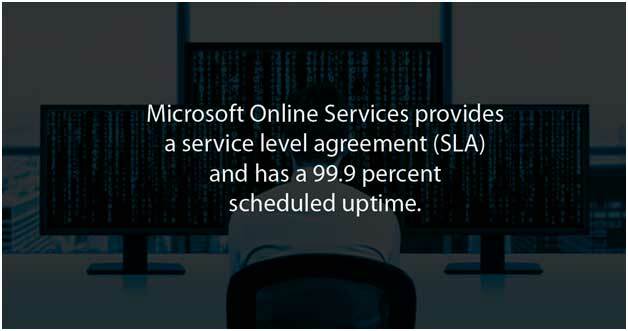 Microsoft Online Services provides a service level agreement (SLA) and has a 99.9 percent scheduled uptime. Office 365 brings automatic backup to the cloud and online file synchronization. Microsoft has multiple datacenters, located all over the world, hosting redundant network architecture. If there is an outage at one datacenter, another can act as a backup. Customers hosted by the first datacenter are transferred to another, with as little service interruption as possible. In today's economy, many companies can't upgrade all of their desktop systems to the latest operating system. But do not worry. 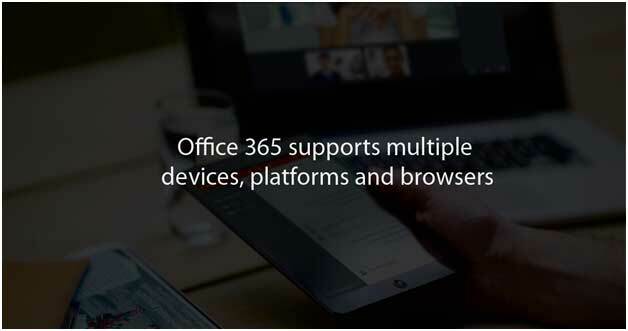 That's not a requirement to use Office 365. Microsoft Online Services support not only Windows 10 and Windows 8, but also Windows 7 Service Pack 1. Mac users can also access the Office 365 applications, using OS X 10.10 (Yosemite) or above. The online Web portal for administration works with Microsoft Edge browser. Office 365 is also designed to work with the current or immediately previous version of Internet Explorer, Mozilla Firefox, or Apple Safari. The Outlook Web App can also be accessed with any of those browsers or with Google Chrome. Standalone office applications can also be accessed from smartphones running Windows 10, iPhones and iPads running iOS 8.0 or above, and Android devices running KitKat 4.4 or latest version. Businesses today need productivity services that help users get more done from virtually anywhere while maintaining real-time collaboration. The latest version of Office always available to you and your people - virtually anytime, anywhere. And that is the most interesting part of Office 365. All Office 365 business solutions come with 1TB of cloud storage that is sharable. Two or more users can edit the same document at the same time. If you don't have Office installed, you can use Office Web Apps to work with your documents in a Web browser. Also supported is PowerPoint broadcasting, which lets you broadcast your slide shows across the Internet even to people who don't have PowerPoint. And you can manage documents offline and have everything automatically synchronized back to the server when you reconnect - a big plus for those who worry that cloud computing means being unable to get work done if you don't have an Internet connection.